Last week we told you we would be having a guest news anchor in our studio today. He won the Sign1News “Become An Anchor For A Day” auction package at Atlanta Area School for the Deaf’s annual fall festival fundraiser earlier this year. Some of you may already know him. He is the former president of Georgia Association of the Deaf. He has won numerous awards for his work in the deaf, deaf-blind and hard of hearing communities. He was on the board of the Georgia Vocational Rehabilitation Agency (GVRA). But most importantly he is my mentor and friend. 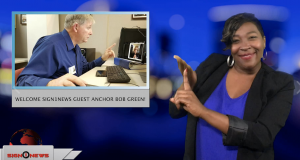 Please welcome guest Sign1News anchor Bob Green.